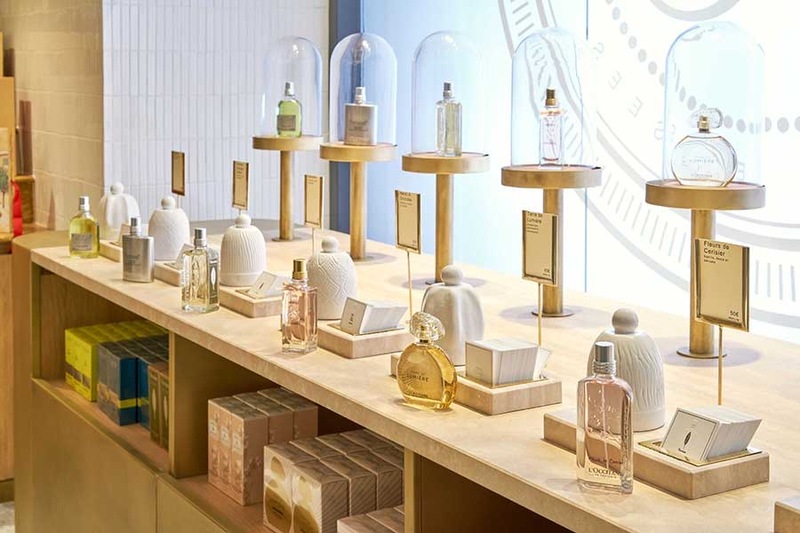 L’Occitane en Provence the venerable fragrance and beauty brand, founded in 1976 by Olivier Baussan, partnered with Pierre Hermé, the “Picasso of pastries” in December 2017 to open 86Champs. A 10,000 square foot concept store on Avenue des Champs-Élysées. France, revered the world over for its food, fragrance and beauty products, has combined all three into 86Champs. Enter the space and your are met by L’Occitane displays, showcasing a wide array of familiar Mediterranean-inspired products and a smaller selection exclusive to 86Champs. Proceed a bit further to the circular Pierre Hermé patisserie counter and dessert bar. Here select confections are prepared to order in full view of guests. Seeing Hermé’s team in action will give you a new appreciation for the care and craftsmanship that goes into the menu items. Not to be out done, the food at 86Champs does not take a back seat to Hermé’s desserts, far from it, the food and beverage selections are carefully chosen to compliment Hermé’s handiwork. 86Champs is a very popular destination. You are welcome to enter to peruse L’Occitanne, but reservations are highly suggested for Pierre Hermé. Additional Hermé boutique locations can be found here.